A US-American long-range drone of the type „Reaper“ has completed an automatic take-off and landing procedure for the first time. This was announced by the manufacturer General Atomics on its website. The two manoeuvres were carried out by the US Air Force in August. The military used a drone of the latest MQ-9 Block 5 series. The „Reaper“, flying with a turboprop engine, remains in the air for more than 24 hours. It carries a payload of 1.7 tons and can be equipped either with sensors for reconnaissance or with weapons. 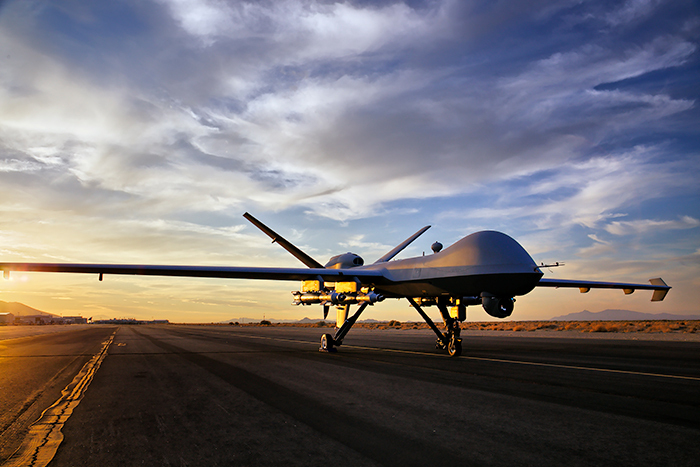 Even when armed, the „Reaper“ flies with a high-resolution front camera and a radar unit. General Atomics describes the tested function as „Automatic Takeoff and Landing Capability“. It is intended to increase the range of applications for the drones. As far as known, the „Heron TP“, which is now being procured by the Bundeswehr, also has an „Autonomous Take-Off and Landing System“. The drone uses GPS data for this, and a radar-based system is also used for emergency landings. According to General Atomics, the automation of central functions such as take-offs and landings should relieve the pilots. The „effectiveness“ of the combat force will also be increased. According to the armaments company, its procedure should work in any weather. This would make the drones more independent, more flexible and safer. The drones equipped with the automatic system could, for example, react better to crosswinds. Last week it became known that a „Reaper“ drone shot down another drone in air combat. The information comes from Colonel Julian Cheater, the commander of an air combat command at the military airfield in Creech/Nevada. The Luftwaffe had recently replaced some of its „Predator“ with the new model, which can carry four rockets of the type „Hellfire“ or remote-controlled bombs. The test is supposed to have been happening in November last year. The inferior aircraft was the MQ-1 model, the predecessor of the „Reaper“, known as the „Predator“. An air-to-air missile controlled by infrared technology was used. However, it is unclear to what extent the launch was automated. According to the US colonel, the local air force is preparing for air wars against Russia or China. By automating the combat functions of its drones, the US Army is forcing its opponents to shorten the response time of their systems by taking over essential routines from computers. Scientists warn against this „robotization“, which also puts armies under pressure to adapt. The German Ministry of Defence is also researching the increasing automation of its manned and unmanned aircraft. For example, drones could fly in combination with a combat aircraft and be controlled by its pilots. More and more functions could be performed independently by the drones. So far, long-range drones have only had „collision avoidance“ capabilities. Such a system warns pilots of collisions and gives evasion recommendations. The actual avoidance manoeuvre continues to be performed by the pilots, who receive flight data such as speed, altitude and course. As assistance, the drones also have a weather radar to detect thunderstorm cells. The drone manufacturers are therefore working on procedures with which drones can independently avoid collisions. This is a prerequisite for the aircraft to be certified to operate outside military reserved airspaces. According to its own information, the Dutch space institute NLR has already developed a reliable evasion system for helicopter drones. For the military drones ordered by Switzerland, the Israeli Elbit Group intends to develop a corresponding technology by 2021. The Israeli manufacturer of the „Heron“ drones is also working with the US company Honeywell on such a procedure. According to media reports, Honeywell’s cooperation with the US manufacturer of the „Predator“ drones is much more advanced. The German government expects a functioning alternative system „from 2020 at the earliest“. According to the Ministry of Defence, the „ACAS Xu“ system is the most advanced. It is being developed and tested on behalf of NASA and would be installed in the PEGASUS spy drones ordered by the Bundeswehr in the USA. The testing and certification of the alternative system would be carried out by the German Ministry of Defence in cooperation with the German Aerospace Center, which has already concluded a cooperation agreement for this purpose. Image: A USAF MQ-9 (General Atomics).